Taiwan, Malta and Ecuador top the list of the best places to live abroad in the third annual InterNations Expat Insider 2016 survey. With more than 14,000 respondents, it is one of the most extensive studies ever conducted to explore the general living situation of expatriates. For the third year running, Australia ranks in the top ten, rising from 10th place in 2015 to 7th out of 67 countries in 2016. Unsurprisingly, the survey conducted by InterNations shows that Australians give expats and their families a warm welcome upon arrival. While good job prospects and a healthy work-life-balance also draw a smile on expats’ faces, the high cost of living holds the country back. The InterNations Expat Insider survey ranks countries by a variety of factors such as the quality of life, personal finance, working abroad, and settling in. After ranking first for two years, Ecuador has now lost its crown and has been dethroned by career boosters Taiwan and Malta. While Ecuador has dropped from 7th to 30th position in the Working Abroad Index, mainly due to heavy losses in the Job Security subcategory, Taiwan and Malta come in second and fifth for working abroad. In addition to the best overall rating, Taiwan also holds first place for personal finance and quality of life, and second place for its working conditions. An impressive 85 percent of expats are satisfied with their financial situation, compared to a global average of 64 percent saying the same. An even higher percentage of expats in Taiwan praise the quality and affordability of the local healthcare system, with 94 and 95 percent respectively. Malta, ranking second this year, has jumped from 42nd to 6th position for personal finances, despite the fact that one-third of working expats in Malta say their income is generally lower than back home. This may be due to the high rankings for general cost of living and affordable housing, which are both rated very well by 30 percent of the survey respondents, as opposed to a global average of only 14 and 13 percent respectively. Australia proves itself to be a popular place for expat families, coming in 7th in the Family Life Index, an improvement from 9th in 2015 and 2014. Among parents living in Australia who took the Expat Insider 2016 survey, 92 percent are happy with family life in general, and the same percentage agree that Australians have a friendly attitude towards families with children. An impressive 90 percent of expat parents living in the country are happy with the overall safety of their children, compared to three-quarters around the globe. Indeed, 88 percent are overall satisfied with their children’s health, and 49 percent even say that they are very satisfied. Education is also seen in a positive light — 84 percent rate the quality of education in Australia favorably, with 64 percent also saying that it is easy to afford. However, families with young children are not so positive. While 49 percent say that childcare options are numerous in Australia, 51 percent would not agree that childcare is easy to afford. Expats in Australia rank the country just inside the top ten, at tenth place, of the Working Abroad Index. Not only do those working in the country feel happy with their future career prospects — 67 percent rate this factor positively — but the majority is also happy with their work-life balance, with 71 percent saying they are content with this aspect of life abroad. There is, however, a noticeable problem for those living in Australia and that is the cost of living. The country comes 52nd out of 67 countries in the Cost of Living Index, with 52 percent rating the cost of living negatively compared to only 32 percent globally. Also, 62 percent are negative about the availability of affordable housing in Australia. However, while many expats are unhappy with the high cost of living, just 10 percent say that their disposable income is not nearly enough to cover everything they need in their daily life. Furthermore, 61 percent are generally positive about their financial situation. While the cost of living in the country may be high, respondents living in Australia are happy with the quality of life and ease of settling in. More than one-fifth (21 percent) say their main reason for moving there was the quality of life, while 29 percent think it is very easy to get used to the local culture, compared to 16 percent around the globe. As would be expected, more than seven out of ten (71 percent) say they are happy with the friendly attitude towards foreign residents. In fact, 17 percent of those asked were so happy with their lives in Australia that they obtained the citizenship of their destination, noticeably more than the global average of 11 percent. Australians who relocate abroad seem to be doing rather well for themselves. Among those who say they are employees and managers, twice the global average of 14 percent say that they are in top management positions (28 percent). Australian expats also tend to work harder than their global counterparts or indeed than they might have needed to at home in Australia. The average working week of an Australian expat in a full-time job is 47.6 hours, compared to 44.6 hours globally. Nonetheless, 51 percent say that their income is overall lower than what they would earn in a similar position back home. It would appear that Australians are not in favor of moving to countries too far afield. Among the three most common destinations are two countries in Southeast Asia: Indonesia, Thailand, and the USA are the most popular destinations for Australian expats. This preference to countries closer to home might be due to the fact that a quarter are experiencing their first stay abroad and nearly half (48 percent) only speak their native tongue. 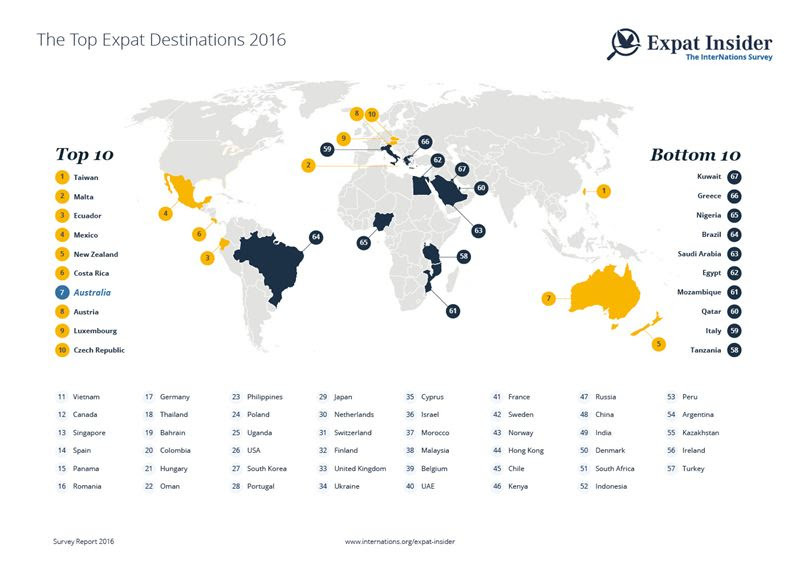 Find more InterNations Expat Insider 2016 rankings, reports and infographics on www.internations.org/expat-insider.